Allevyn Gentle Border Lite Wound Dressing from HealthyKin.com is a silicone gel adhesive hydrocellular foam dressing. Through optimal fluid management it has a lower risk of maceration, extensive wear time, retention and is resistant to leakage. Allyvyn Gentle Border Lite provides a bacterial barrier that may help reduce the risk of infection. It easily molds to body contours and hard to dress areas. Allevyn Gentle Border Lite adheres gently to surrounding skin. 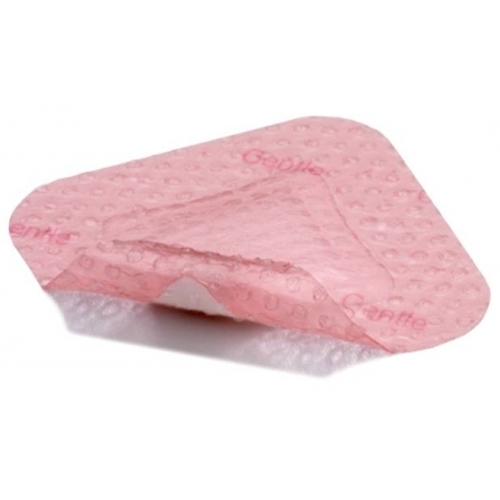 The soft silicone adhesive is ideal for fragile skin. Allevyn Gentle Border Lite is indicated for wound management by secondary intention on shallow, granulating wounds, chronic and acute low exuding wounds full and partial thickness wounds. Dressing met expectations. Was especially pleased with such prompt delivery. I was going to have to order these through a medical company the doctor sent me to. I couldn't believe how expensive they were. I decided to look on the internet to see if I could find these bandages at a price I wanted to pay. I was amazed to find them at the price I did from Healthykin.com. I needed the bandage as quickly as possible and the ordering and shipping were both quick. Thanks Healthkin.com. I will definitely order from here again. These are great dressings. I appreciated they were more reasonably priced here. The delivery time was wonderful. Thank you for the great service!! As I have come to expect from Healthkin these bandages were everything they claim to be. I have been a Healthkin customer for 2 years and always go to them first for all my health care needs. Fast shipping & customer service is great. I'm a return customer and will always buy the Allevyn wound dressings from healthykin.com. The price is unbelievable. Great bandages; they work just as advertised. I have left one on for the full 7 days with no problems. Gentle on sensitive skin areas and waterproof so showering is no problem either. Best price & quick ship from Healthykin. Thanks to healthykin.com we can afford to buy these bandages for a wound on my husbands leg. Fast shipping as always.